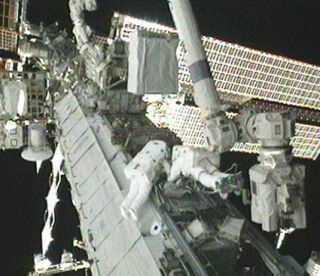 NASAis steadily reviving systems on the International Space Station following a seriesof complicated spacewalks to repair its vital cooling system. Flight controllers on Earth are reactivating somesystems for the first time since July 31, when an ammonia coolant pump failureknocked out half of the space station's cooling system. The station's astronautcrew replacedthe faulty pump in three spacewalks, with the most recent one on Monday. "Essentiallythe coolant loop is operating and flowing ammonia again," NASA spokesmanKyle Herring told SPACE.com. "This morning, they were in the process ofbringing systems back online." Duringthree spacewalks, NASA astronauts Douglas Wheelock and Tracy Caldwell Dysonremoved the faulty ammonia pump and replaced it with one of four spares storedon the exterior of the InternationalSpace Station. ? Withthe repairs complete, station flight controllers are methodically restartingmany of the systems that were placed offline. These include theelectrically-driven gyroscopes that help maintain the station's attitude, andthe second string of electronics for the space station's robotic arm, Herring said. "Wewere able to operate all the spacewalks on the single string, so it was not afactor," Herring said. "The robotic arm works just fine on a singlestring, but of course, we always want to have redundancy available." Scientificresearch was stalled as well, though mission planners are taking a close lookat what experiments may be salvaged in the weeks ahead. "Atthat point, the planning team will start to see where they can reschedule allthe activities, like experiment work, that had to be deferred," Herringsaid. Atthe moment, station managers predict that the space station should be fullyoperational ? as it was before the incident occurred ? by Thursday. Thespace station is home to six astronauts; three Americans and three Russians. Thestation is slated to keep flying through at least 2020, so spare parts will bea major concern once NASA's space shuttles stop flying next year. NASAcurrently plans to fly two finalshuttle missions (in November of this year and February 2011) beforeretiring its three-shuttle fleet for good. The possible addition of a thirdshuttle flight is being discussed in Congress.